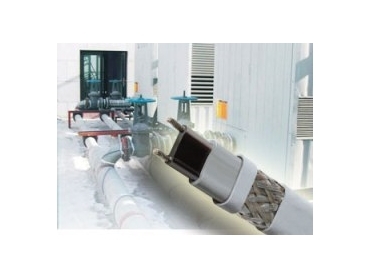 FLX self-regulating heating cables, available from Thermon Australia are designed to provide freeze protection and temperature maintenance to metallic and nonmetallic pipes, tanks and equipment. FLX heating cables are rated for heat outputs of 10, 16, 26 and 33 watts/meter at 10°C when powered at 230 VAC. FLX is a proven, simple, practical solution for both metal and plastic pipes. FLX self-regulating cables are protected by a tinned copper braid and a polyolefin outer jacket to provide grounding and additional mechanical protection for the cable. An optional fluoropolymer outer jacket is available if additional environmental protection is required. Heat tracing users expect quality products and services from a reputable manufacturer. Thermon exceeds these expectations by operating under the ISO 9001 standard for quality. Whether the application is a small project or a complex network of piping and equipment, designing an electric heat traced freeze protection system is easy with Thermon self-regulating cables. A simple cable selection chart based on pipe size confirms product application; see selection guide for details. With parallel circuitry, self-regulating cables do not require piping dimensions and can be cut to length in the field. Heat tracing circuits for field-routed piping can be quickly and easily designed on site. Simply pull FLX from the supply reel, install directly on the pipe and complete circuit fabrication. Tee splices may be installed anywhere along the circuit to match the layout of the piping. Supply voltage is 110-120 or 208-277 VAC.